​Have you had the chance to explore the Volunteer Toolkit (VTK) and all that it has to offer? Or maybe you’re totally new to the VTK? Either way, that’s A-OK – we've got you covered! 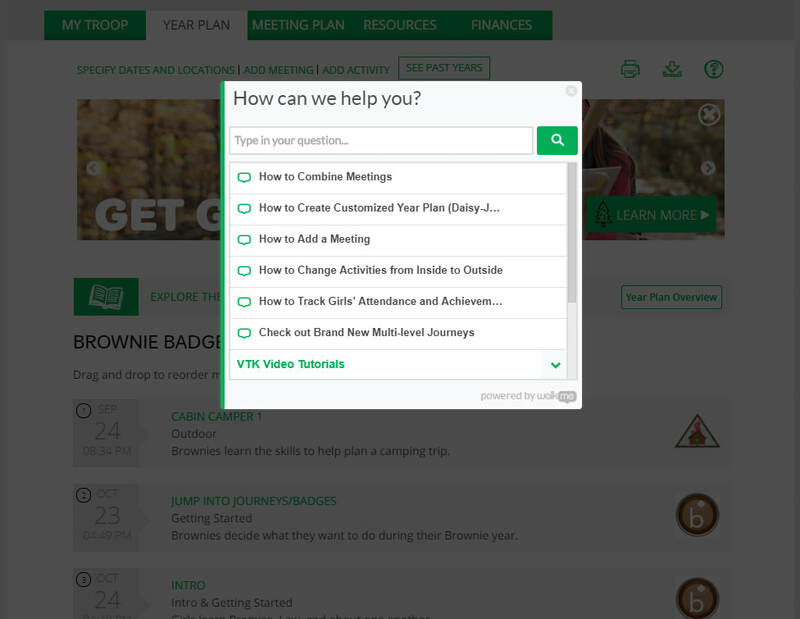 The Volunteer Toolkit is a digital resource that supports troop leaders and co-leaders, making the process of running a troop easier and more efficient. 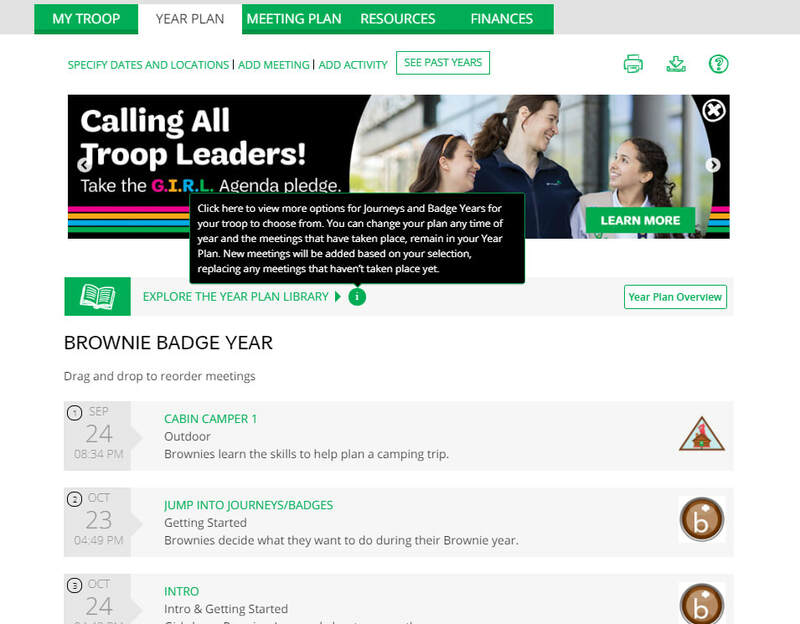 Through the VTK, troop leaders can plan the troop’s calendar year, email parents with one click, manage the troop roster and membership (hello, quick and easy Renewal! ), access badge and Journey content, and so much more. In early 2018, GSUSA rolled out a few enhancements that we’re excited to share with you – a major update to the Resources tab, an all-new interactive Help Menu, and Smart Tips designed to make VTK usage a breeze. The new Resources tab provides quick access to the information you need the most, organized by topic and program level. Here, you’ll find everything from program-specific resources (think: Award Logs, Uniform Placement guides, and Bridging requirements) to helpful GSSOAZ-specific links for Highest Awards, trips and travel, product sales, and more. Once you're logged into MYGS, navigate to the Resources tab by selecting Volunteer Toolkit > Resources. The VTK Help Menu is here when you need it the most (and out of the way when you don’t)! To access the Help Menu, simply click on the fly-out panel. From here, you can quickly type your question into the search box to comb the list of the available how-tos. Walk-Thrus (denoted by the speech bubble icon) will seamlessly generate an interactive, step-by-step tutorial designed to help you navigate the VTK and complete your desired task from start to finish. If you select a video tutorial (denoted by the play button icon), one of GSUSA’s Volunteer Toolkit demo videos will pop up on-screen to give you a no-nonsense overview of the VTK’s various features. You’ll now find Smart Tips sprinkled throughout to make it easier than ever to have an intuitive experience with the VTK. Wherever you see a Smart Tip icon (green circle with an “i” in the center), just hover your mouse over the icon to learn more. If you already have a favorite troop management system in place for this year, that’s fine too! Don’t feel like these enhancements mean you need to dive right in and re-build your troop meeting plan from the ground up. The Volunteer Toolkit is an added resource for new and returning volunteers and there isn’t a right or wrong way to use it—so log in, take a look around, and see what you think! *This post has been adapted from GS of Northern California's guide to the VTK. At Girl Scouts of Southern Arizona, our business is helping girls thrive as they grow. Keeping kids safe is a huge part of thriving. We know that kids today face more and different challenges to their safety than was the case when many of us were growing up. We are proud at Girl Scouts of Southern Arizona to have answered the call to action on how to prevent, recognize and react to the epidemic of child abuse. We seek to inspire all our Girl Scout adults to be Stewards of Children. Did you know that 1 in 10 children will be victims of sexual abuse before they turn 18? The financial, social and economic costs are incalculable, not just for the child and their family, but for society as a whole. It is a public health issue that needs focused efforts on educating adults about child safety. It is unrealistic to think that a young child can take responsibility for fending off sexual advances by an adult. Adults are the ones who need to prevent, recognize and react responsibly to child sexual abuse. Yet, the statistics clearly show that adults aren’t shouldering this responsibility. We believe that adults want to, they just don’t know how. The training is available in person or online, in both English and Spanish. If you’d like to learn more please visit Darkness to Light for a wealth of resources including a new app that puts information and skills at your fingertips. Timalee is Chief of Staff at the Girl Scouts of Southern Arizona. It is because of her connection to amazing women who helped her find the courage to stand in truth, to tell her truth and to heal her truth that she learned to live more authentically. At Girl Scouts she has a passion for lifting up women of all ages. Timalee is also a Darkness to Light Certified Instructor and an Authorized Stewards of Children Facilitator. An anonymous reminder from a long time Leader. When I first started as a Troop Leader six years ago, I had a new group of kindergarten Daisies. In this group were a couple very shy girls, a couple overly-outgoing girls, a handful who just rolled with whatever we did, and one who was wild (you know the one...we ALL have at least one!). Fast forward six years to today: some of our girls have moved on, some new ones have joined, but as the Leader, I have watched them all as they grow, and seen who they have become. One of the shy girls from the first year of kindergarten (the one who never said a word and often hid behind her mother's legs) is now out front and center. Head high at the booth, she asks EVERY person if they want to buy Girl Scout Cookies, counts back change, and interacts with customers so naturally. She is our top seller, selling well over a 1000 boxes of cookies every year. One of the overly-outgoing ones (the one who talked over everyone, who threw fits and pouted when she didn't get her way) now is at the booth working with her sister Girl Scouts on a plan to switch jobs every 30 minutes. I can see her figuring out how to get to practice on time and still get in more hours at a cookie booth so that she can reach her goal. One of the go-with-whatever girls (the one who never used to contribute any ideas, who never had an opinion about anything) — well, now she is the one who makes suggestions on where to go and how we can make things better in our community. She fights for her ideas with well-thought-out and persuasive words. Last but not least, the wild one (the one never in her seat, talking out of turn, acting crazy and never on task)... She is still wild and crazy, but she talks to customers, helps set up and clean booths, makes up cheers and songs to pass the time during slow periods. She is learning when she is stepping on others' toes, and apologizes when she needs to. 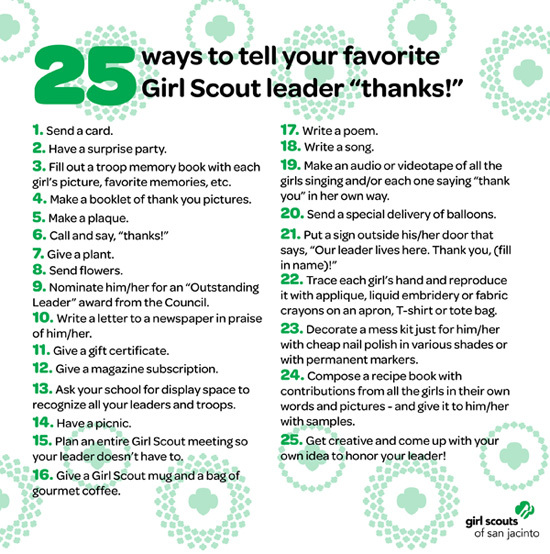 Each one of these girls gets something different out of their time in Girl Scouts, learning life skills and developing themselves into young women who will move mountains and rock the world. But it is not just the girls who get to benefit from this amazing organization. I am blessed to be able to see the transformation, see the growth, see their faces when they explore new ideas and activities -- see the courage, confidence and character that each girl builds everyday. So when the world starts to get crazy and you think WHY am I doing this!? Take a second to sit back and watch your girls... They are learning, growing, and becoming amazing individuals, because YOU made a commitment to the them and chose to be a part of this experience with them. ​Enjoy the CRAZIES and all that comes with it!! This post was provided by a GSSoAZ Leader who asked to be anonymous.